In the early nineties, when I was thirteen, I performed in a school play in blackface. The play was ‘The Miracle Worker’, the uplifting tale of the blind deaf-mute Helen Keller and her search for language. I was playing Martha, a slave girl in the Keller’s Southern household whom Helen attacks one day with a pair of scissors. My immortal line: “Mammy, mammy, she tried to poke my eyes out!” With my hair in braids and my squashed nose, perhaps I gave a passable impression of a black girl, but the same cannot be said for my friend Jean-Marc who played my brother — his slim Gallic features contrasted terribly with the dark foundation we daubed on so liberally. Almost twenty years later, a blond blue-eyed American girl at my old international high school came to Halloween dressed as A Black Person – dark foundation, braids, the works. In her case, the authorities frowned deep opprobrium – I imagine she was sent home from school early, or banished to the washroom with stern instructions. What has changed, I wonder, in twenty years, to turn the use of blackface from something officially sanctioned to something cringe-worthy and condemned? And why is it that Malaysia as a whole seems immune to this change? For decades it has been distinctly unpolitically correct to appear in blackface in America. The use of blackface in America dates back to minstrel performances in the 19th century where stock characters – the lazy and lying slave, the stupid devoted mammy, the dandified free black man – were familiar stereotypes played for laughs, kitted out with unnaturally black skin, wide white lips, woolly wigs and rolling white eyes. Blackface enjoyed such acceptance in vaudeville that in some places black artists were only allowed on stage if they too were in blackface. The black minstrel tradition coopted the use of blackface and used it to present caricatures that were self-consciously satirical – poking fun at white folk as well as black folk. But in the last 50 years, the American public opinion has increasingly condemned blackface for its perpetuation of racist stereotypes. In any case, to go to Halloween in blackface in America nowadays is akin to turning up dressed as Hitler. But in Malaysia (at least outside the enclave of my American high school) attitudes towards blackface have followed quite a different trajectory. Last year I saw a dance work presented by DBKL in Panggung Bandaraya in which the cast wore blackface as part of their personification of an anonymous tribe of noble primitives (see my post on the performance). At the time I thought it was an anomaly, a faux pas by someone unacquainted with the delicate line that divides good taste from bad, but even then I marveled at how unselfconsciously it was presented. Then late last year I performed at the TDS Festival of Dance in Putrajaya, together with about fifty other groups from the Klang Valley’s suburban dance studios. In the dressing room, a large group of kids was being dressed in blackface. They wore braids, and ragged tops and skirts in leopard print that stood for primitive animal skins. Their teacher was industriously painting them a charming shade of reddish brown, from the tips of the toes up to the hairline. I felt like telling her that she didn’t need to paint the soles of their hands and feet, but obviously they were going for effect, not verisimilitude. On stage the group in blackface performed the predictable ‘African number’ to a remix of Dr Alban’s ancient dance hit Hello Afrika. They yelled, shook their gilt spears and pumped their hips. As a student dance, it was neatly performed, its synchrony oddly aided by the blackface. This group of girls who in real life were already quite similar (every single one of them Chinese and scrawny) suddenly looked absolutely the same – a pulsing body of whooping reddish pygmies, as oddly compelling as a car wreck. 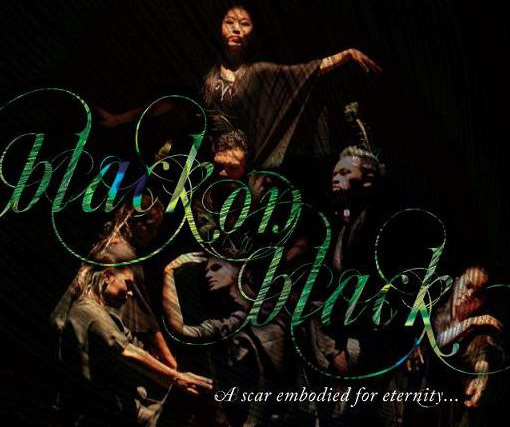 Yet still I was not convinced that these two episodes amounted to anything more than ignorance combined with a desire for a vaudevillian kind of showmanship, until early this year I went to see Black on Black performed at KLPac. If any arts establishment in this city caters to a tasteful and moneyed cosmopolitan elite (or wants to!) it’s KLPac. And yet here on Pentas 2 was a group of Malay ASWARA dancers painted in the blackest of blacks, portraying the struggles of the Tamil community in Malaysia. Some of the cast of Black on Black, without the bootpolish. Black on Black dwelled heavily on the theme that Tamils are disenfranchised in Malaysia because society views their black skins as ugly. This is undoubtedly true. Malaysia is notorious for rigidly maintaining racial divides, if only to draw a line between those who should have (the Malays) and those who apparently should not. Racism is an ugly ubiquity in our daily lives here. You have only to look at the displays for whitening cream in every pharmacy, or to listen to the conversations of even the most well-educated and ‘Westernised’ among us, to find evidence of it. Even our comedy is racist. How many variations do we have on the theme of an Indian, a Chinaman and a Sikh who walked into a bar? But, I wondered, why the use of blackface in Black on Black? And why weren’t any of the dancers Tamil? Was it merely a nod towards practicality – that Lakshman Balakrishnan, the creator of the work, was trained at ASWARA, and therefore the dancers he could mobilise for this piece were all ASWARA dancers, and most ASWARA dancers are Malay? And maybe the dancers were so fair-skinned that the audience might feel a comic disjuncture if other dancers said to their natural faces, “You can never be on TV. So black, so ugly!” Or was the blackface meant to conceal their Malayness, which otherwise we, as well-trained Malaysians, would naturally read into them? 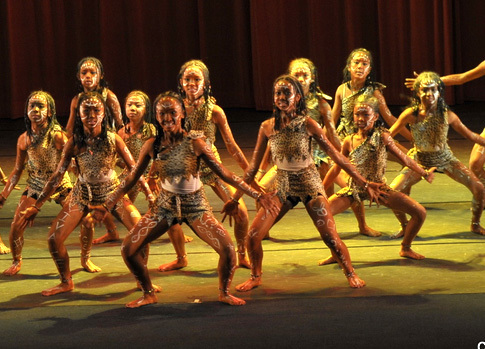 Or was there a less obvious reason – that there was a degree of triumph inherent in coercing Malay dancers, as symbols of the dominant race, to don the dark skin and experience the oppression of the victimised? Or perhaps it was the other way around – that the choreographer wanted to spare his dancers from feeling that any insults were meant towards them personally (if their skin happened to be darker), that the insults were targeted towards the paint. The most intriguing thing about this production was that, after the Tamils had been symbolically cheated by the education system, driven to drug abuse, tortured in custody and blocked from show business, the same dancers reemerged in the final scene with their faces scrubbed and beaming beatifically, to dance a happy round of movements much influenced by classical Indian dance, apparently transcendent and at peace. There was an element of attaining Christian sainthood in this – that the ones who have been driven to death are the same ones who will be resurrected with their faces shining with godliness, to shame the ones who hurt them. That the meek, in fact, will inherit the earth. But at the same time you could read it differently: that only those who can acquire whiteness (or Malayness, one might snarkily add) will live happily ever after. It’s an obvious interpretation, but it goes against the message of the rest of the show. In any case, it left me very puzzled. I think that the decision to use blackface enters complicated and dangerous terrain, even here in a country without the legacy of black slavery. With the use of face paint, we take upon ourselves a representation of the Other, which often brings to light all our prejudices and stereotypes. I’m not suggesting that we should ban blackface, but I do think we should be very clear about what we mean when we use it. Blackface is always a controversial choice, it is never just an innocent device, even when it is used thoughtlessly, because then most of all it can betray an unquestioning assumption that to be primitive is to be black, and vice versa. Image from TDS Putrajaya show by James Q. This article was first posted on the original Arteri site on 12 February 2010. This ain’t no beauty pageant!